Quantitative Optical Tissue Spectroscopy. A new diagnostic tool for detection of biomarkers relevant to cancer tumor therapy and other medical applications. Real-time, non-destructive analysis. Detect oxygen saturation, hemoglobin concentration, cell density and any other absorbers of interest. Allows users to dial in a target pressure for each measurement via the user interface. 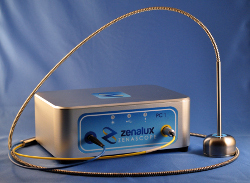 After probe to tissue contact is made, the user interface monitors pressure feedback from the tip of the optical probe. 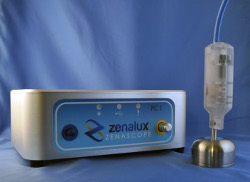 At Zenalux, we want to make optical spectroscopy easy for medical practitioners who are interested in real-time, non-destructive biological tissue diagnostics. Our products provide effortless translation of uv-vis tissue spectra into quantified biological endpoints to enable the medical professional to focus on medical applications of the technology.